That's a beautiful photo! Love the colors! Ha! It's like in Scrooged when Bill Murray suggested stapling the little antlers on the mouse. You can always blame the cat if the neighbor asks you .. I mean, he is wearing the damn thing on his head .. totally looking guilty. Put a copy of the photo in the neighbor's mailbox just to freak them out a little. I agree with Stacia but maybe instead of a Mai Tai for Smokey, it sounds like you could use one after having to get that flower to stay on his head. Haha! Kitties. Putting things on them is awesome. 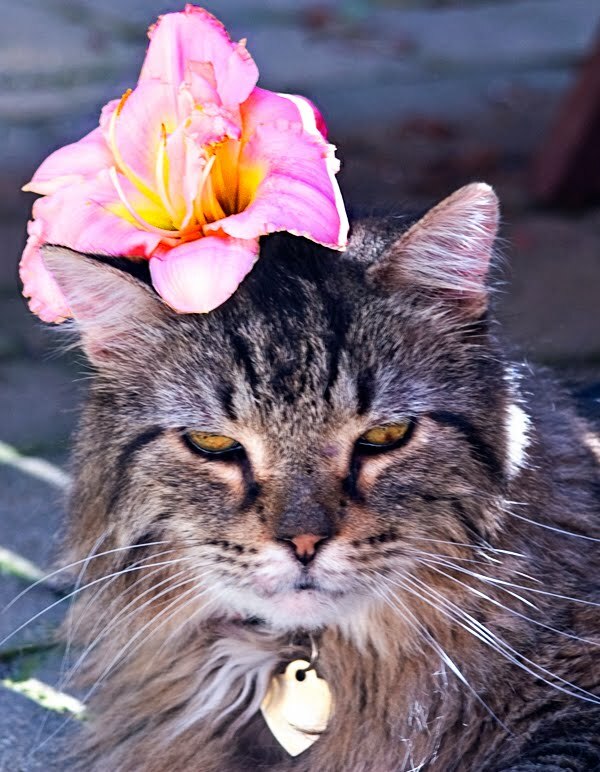 Although now I want a flower on my head, too. I'd even sit still for you. I think you should try a hot glue gun instead of staples.